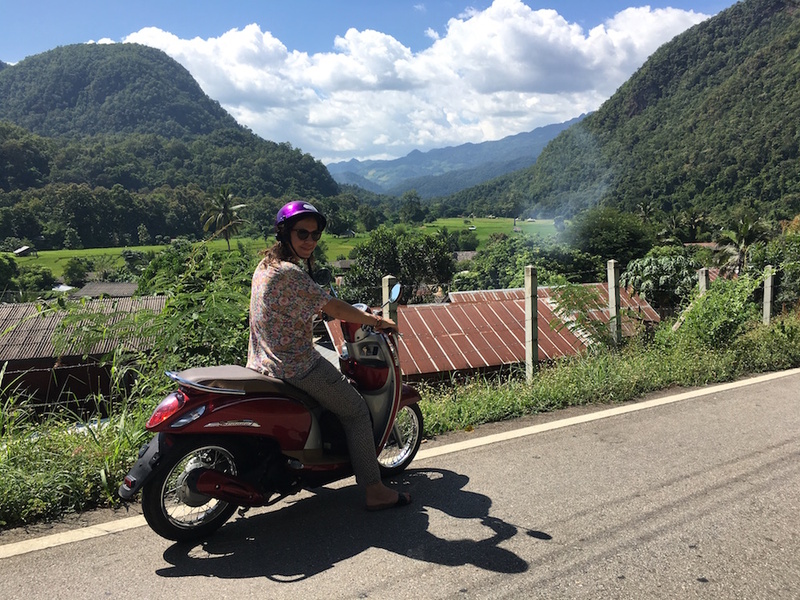 Making your way from Chiang Mai to Pai on a 125cc scooter is not an easy drive, but it is one of our favourite road trips. 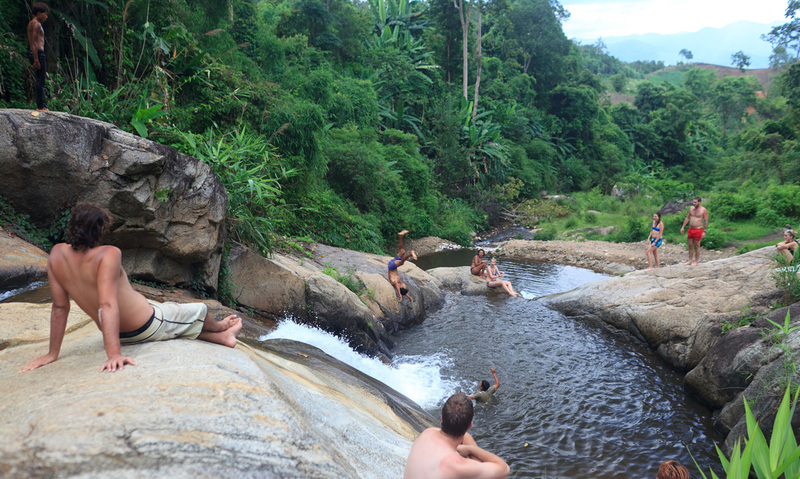 We could tell you about how we conquered all 762 turns up highway 1095 from Chiang Mai to Pai, but if you’re looking to get to Pai yourself, there’s probably a few additional details you’ll need in order to decide on how to best make your way from Chiang Mai to the valley town of Pai. 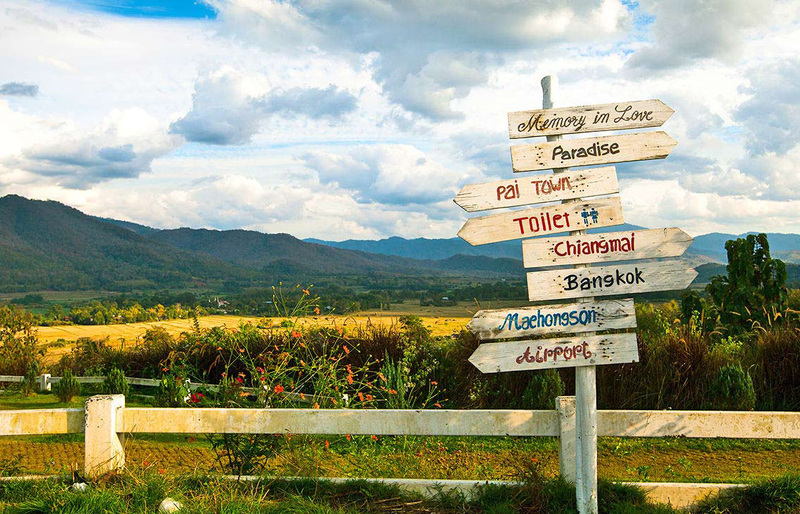 The following are some tips for making your way from Chiang Mai to Pai, including the different methods possible and costs associated with each one. 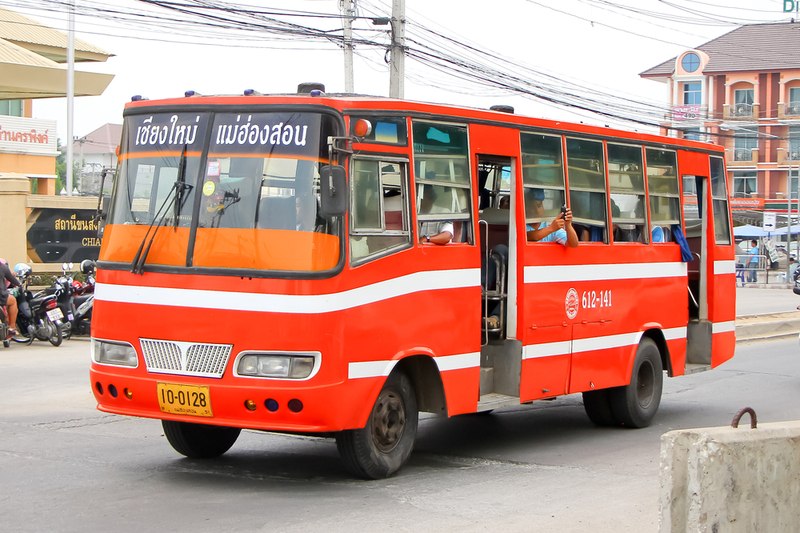 Minibus: You can take either a minibus or a standard bus to Pai. The minibus will run only about 150-200THB each way and will only take 3+ hours but it’s the one where you’ll probably feel the most motion sickness as they drive fast even on the turns. Air-conditioned Bus: These buses take a little longer to navigate through the bends but you’ll save a little money compared to the minibus (100-150THB). If you’re prone to motion sickness and not up for making the drive yourself, this is a slightly better option to the minibus. While you don’t need to rent a scooter to get around, there are many things to see outside the main area. If you’ve taken a bus into Pai and aren’t going to hire a tour, you’ll probably need to rent a scooter once in Pai. The cheapest scooter we saw in Pai is roughly 100THB per day plus gas and we are pretty certain that is without insurance. The total for a week would be 1200+THB (700 for a 7-day scooter rental, 100+ in gas depending on how much you drive, and 300+ for the transportation to and from Pai). Renting a scooter, bike or car offers you the ability to take an amazing drive through the mountains. It will be certainly one of your most memorable road trips. Scooter/bike: A 125cc scooter will cost you minimum 200THB per day and that cost increases as you look at bigger bikes. We recommend Cat motors in Chiang Mai, the entire staff is friendly and helpful. A full tank cost around 100-110THB and you spent less than 200THB in gas to get there. If you stay for a week, we need to pay 1400 in rental fees, and about 500 in gas total. Disclaimer: Don’t forget to get your international driver’s license before renting a scooter to avoid tickets or fines. And Attention! 38 scooter accident related deaths in Thailand every day. If you have never driven a scooter, don’t go renting one in Thailand to “learn”. Safe your life. Your family wait you at home. Car: A car rental, from the company Budgetcatcher, for one week will cost about 4500THB plus gas. Budgetcatcher is one of the Internet leaders in providing great car hire prices in Chiang Mai. All their vehicles and customers are covered by First Class Fully Comprehensive Insurance, and in the unlikely event of a breakdown while you are driving around Thailand all their hire cars are covered by the 24/7 Roadside Assistance, giving you peace of mind. 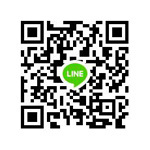 You’ll find plenty of independent reviews on their website or Facebook in Chiang Mai. To rent a car is the safest way to travel to Pai. If you choose to make your own way to Pai, either by car or scooter, there are a few tips that will help make your journey a little easier. While most of these directly apply to driving a scooter or bike, they are definitely good to keep in mind if you are planning to rent a car. Gas. Depending on the size of your tank, you may need to fill up more than once. Since there are long stretches of road without any available areas to purchase gas, we suggest you make note of the meter, and start looking when your tank hits the half-way mark. This is especially useful if you are driving a rental as the gauge may not be correct. 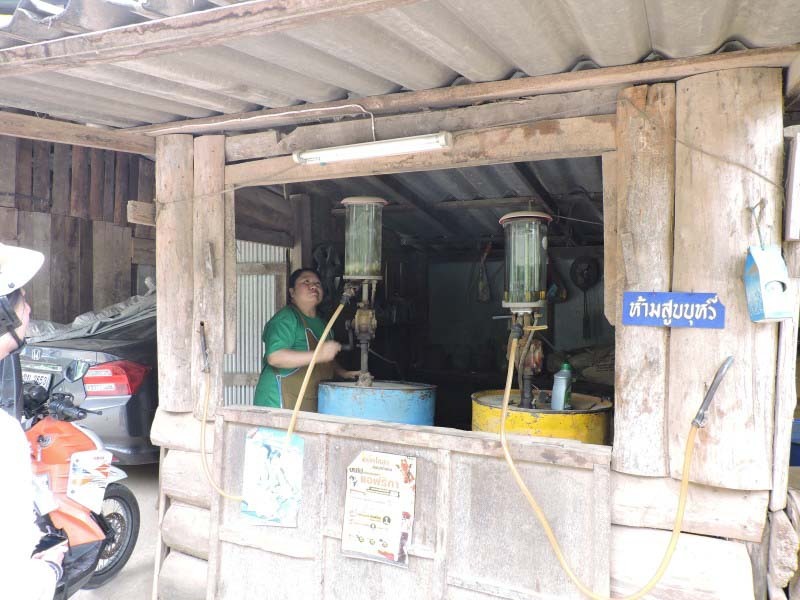 Roadside gas pumps and even bottles of fuel can be purchased at almost every small village you drive through. If you’ve forgotten to check and are desperately low on gas, don’t hesitate to stop in a local area and ask for fuel/gas/petrol. Chances are they’ll be able to help, even if it’s at a premium price. Vehicle. Once we drove a 125cc scooter and while we made it to Pai and back without any real problems, there were a few moments we weren’t too sure we had made the right decision. The tank is small, the bike is small, and there’s not much power. If you’re budget can afford it, you may want to consider a larger bike or a car that can handle the inclines and also ease the drive over the potholes. Potholes. There are many and they are unavoidable. 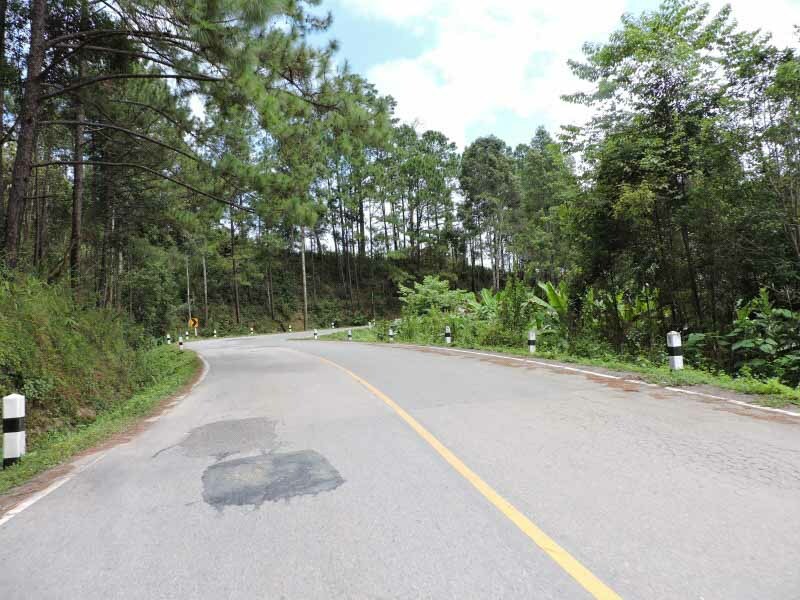 It can be a bit tiresome and straining to be on constant lookout for the obstacles on the road: traffic coming both ways, potholes, sharp curves, steep hills, and sometimes gas slicks from the trucks. Of all of these, potholes are the most frequent and can be pretty dangerous, especially when driving a vehicle with fairly narrow tires. Hydration. It can get pretty hot driving through the mountains in the middle of the day. Unless you end up leaving early, or it rains, chances are you’re going to get quite a bit of sun and having ample water on hand is important. Even if you go early, we still suggest having extra water on hand as you never know what the day will bring. Also buy some snacks just to be on the safe side, especially when you lengthened your trip by stopping at the geyser. Take your time. There’s no need to rush the ride. Take it slow, gas up when you can and make sure you’re prepared and make stops when you need. Not only is a smart thing to do with the length of the drive, there are also some pretty great views to take in on the way! Gauge your experience level. Make sure you are comfortable, not only with driving a scooter, but with driving in Thailand. It’s a completely different experience and it can take time to get used to. In case your afraid driving a scooter, to rent a car is the easiest and safest way to travel to Pai. The route. The route is fairly simple. Once you get to the 1095 there’s really no where to go until you hit Pai. The complicated part is in the road itself. As we discussed, there are tons of potholes, fast drivers, and incredibly winding, narrow roads. Weather conditions are also variable as you are heading up into the mountains and then down into the valley so they can change at any moment. The route is tricky and has it’s dangers, so be carefully all the time. 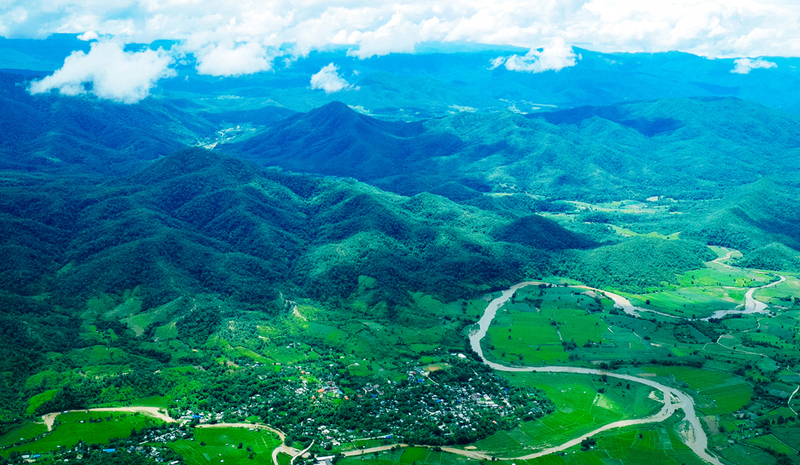 Taking a plane straight to Pai is also an option. The airport is located Northwest of the central part of town and flights can be taken direct from Chiang Mai. 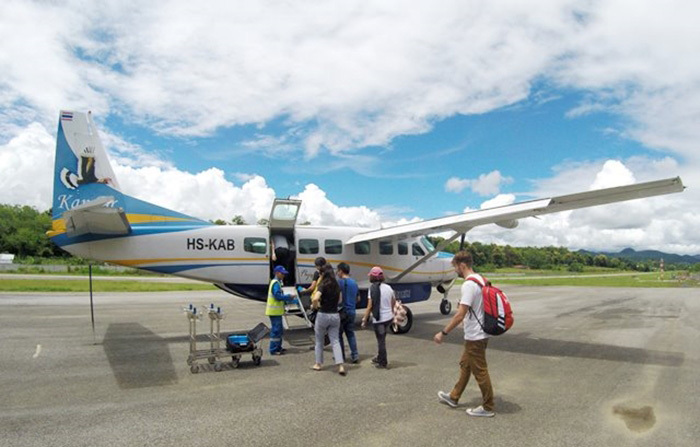 The flight is only about a half hour and while prices vary depending on airline and time of year, we found a cheap flight through Kan Airlines for around 1900THB at the start of their high season. Other airlines to look at within Thailand are AirAsia, Thai Smile Airways, Nok Air and Tiger Air.